Chambersbury Primary School is based in Hemel Hempstead, Hertfordshire. 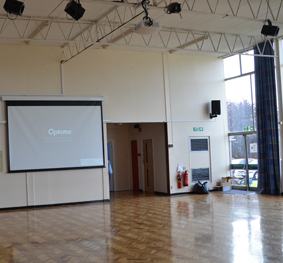 Challenge: Chambersbury Primary School needed a new cost-effective projection system for its bright assembly hall that has floor to ceiling windows and a high ceiling. 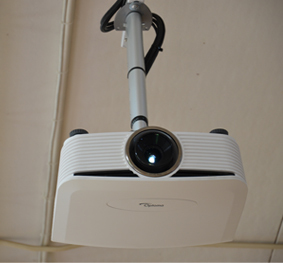 Solution: The school installed the Optoma ProScene W505 5,200-lumen WXGA projector with a standard lens. 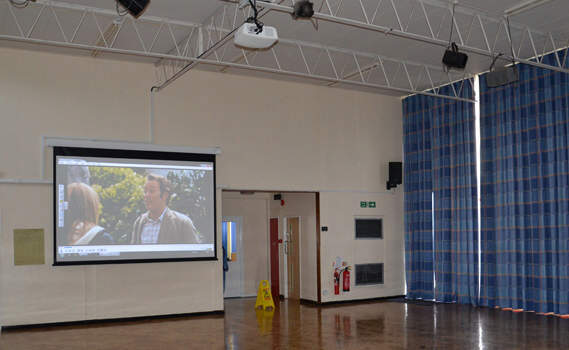 Chambersbury Primary School needed a new cost-effective projection system for its assembly hall. The hall has floor to ceiling windows and the ceiling is high. These factors meant the projector needed to be bright with vibrant colours to contend with the high level of ambient light. 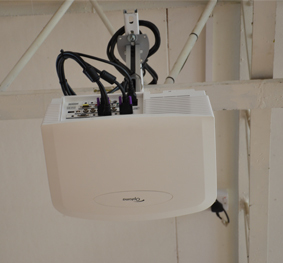 And because it would be installed high on the ceiling, it needed to be extremely reliable, as getting access to this after installation would not be straightforward. The school installed the Optoma ProScene W505 with a standard lens. Ideal for halls, lecture theatres or large meeting rooms, this 5,200-lumen projector with WXGA resolution and powerful image blending tools delivers spectacular image quality and outstanding brightness. It features DLP® technology, pioneered by Texas Instruments, which produces high quality imagery that does not suffer colour degradation over time, as sometimes experienced in other projector technologies. The dust-sealed, filter free design prevents dust and dirt from affecting the system ensuring optimal image quality with minimal maintenance and ultimate reliability. The W505 has five lens options, with zoom and focus adjustment to get the exact image size needed, while the wide lens shift range and off axis short throw lens option gets the image exactly where it is wanted. With full support for Crestron, Extron, AMX, PJ-Link and Telnet LAN commands, the projector can be controlled and monitored remotely over a LAN. It also has a DICOM simulation mode which is tuned for greyscale images and perfect for viewing X-rays and scans during medical training. The projector was connected to an input wall plate that has VGA, HDMI and composite inputs ensuring connectivity to all sources the school would need. Speakers around the hall are connected using the audio output and the imagery is projected onto a 3m wide electric screen. Mr Taylor said: “We are really pleased with the image quality and the brightness of the projector. We can even use it without having to close the curtains. “One of the main things that I like about our new projection system is that the children can walk close to the screen and no shadows are cast across the image. We previously used a smaller projector that we wheeled out on a trolley. This was not only impractical but did not produce a bright or large enough image. Our Christmas film last year looked pretty washed out.